Nate and I have an on-going, years long project cleaning out the cellar. It’s so on-going, in fact, that it never gets any more cleaned out, because by the time we get around to getting rid of a batch of stuff, more stuff has accumulated to take its place. Yet we persevere. A couple of weeks ago, we finally unpacked the very last box from our move, (ahem) 10 years ago. It was full of old picture frames and a Tape/CD player combo stereo unit. 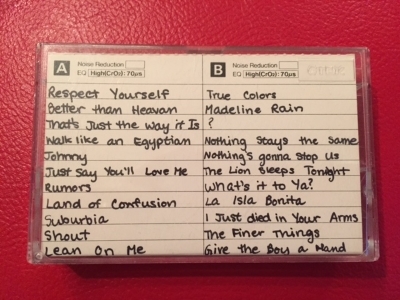 And… a little box full of my old mix tapes. When I was in high school, before I could afford a CD player, I taped songs off the radio. I would have my little radio/tape deck on record-pause, and I would hear a favorite song come on the radio, and I’d leap across the bed and un-pause the record as soon as the DJ stopped talking. The worst was when he talked over the first bit of the song and I had to wait for them to play it again! I listened to KYUU, KMEL, K101, and there was also an oldies station that for the life of me I can’t remember. Anyway, I would flip back and forth across the dial, waiting for my favorite songs to play. Unbelievably, we still have a working tape player in the house. 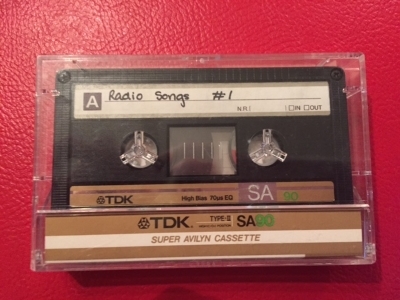 It hasn’t been used in who knows how many years, but I loaded up “Radio Songs #1” and was instantly transported back to what must have been the first few months of 1987. Age – 13.